Christ King's 4th and 5th graders aren't old enough to drive, but they will be the CEO's, CFO's, and workforce of JA BizTown. This junior achievement program begins in the classroom where students will receive several weeks of instruction on the economy, supply and demand, producers and consumers, and spending and saving, before applying and interviewing for positions at BizTown companies like Kohl's, Culver's and the BizTown radio station. They then set up their business accounts and work plans for their businesses with the JA Bank. Every other year, our students travel to BizTown where they are responsible for the local economy for the day. At Christ King School, Battle of the Books (BOB) is a voluntary reading enrichment program for proficient and advanced 4th, 5th, and 6th grade readers designed to extend a student’s comprehension skills. Students are required to read a variety of books from the approved Battle of the Books list. The titles range from classic to present day award winners. 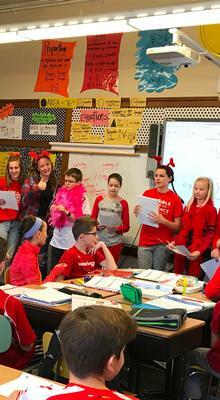 In addition to reading the books, students are required to take notes and recall information regarding the characters, setting and events of the books during a team based competition. Teams are formed early in the school year. Each team consists of two - three members in their grade level, and they work together to complete the reading list of 45 titles. The books vary in length as well as difficulty. For each child’s convenience, the page length and Lexile (book level) are included on the book lists. Lexile numbers range from 550 to 1130, with 550 being the lowest and less challenging of the texts. In late January / early February, all teams participate in four “battles” where they answer 15 questions in each battle. Questions are posed in the following manner: In which book…? The students respond with the title and author. After all four battles have been conducted, and the points have been totaled, the team with the highest score (at each grade level) will advance to the regional competition. At this final competition, our CK students will be competing with winning grade level teams from Milwaukee area schools. The art of Quilling began in the monasteries and convents during Renaissance and continues at Christ King School! Students from 5th through 8th grade gather weekly during recess to craft, twirl, shape and trim as they enjoy an atmosphere of serenity. It's an opportunity to relax, let worries and work disappear, and quietly stimulate the brain by building cognitive skills as well as refine motor skills. Student Council consists of four committees: Communications, Service, School Spirit, and Spiritual. Each of the four committees is lead by a team of two elected 8th grade students. Members of each committee consist of three members, a 6th grade student, a 7th grade student, and an 8th grade student. Write and deliver a two two-minute speech to all middle school students. Create and hang posters around school. Get one letter of recommendation from a staff member at the school or church. If any of the above requirements are not completed, a student is not eligible to run. Write and deliver a two-minute minimum speech to all members of their grade. The Middle-Level Book Club is a wonderful way to connect parents and their children to literature while earning academic credit. Parent organized and teacher directed, the book club allows 6th, 7th, and 8th graders a way to express their thoughts on high interest as well as classic selections in a relaxed atmosphere. It allows parent leaders to support skills that are being honed in the classroom while enjoying another studious and insightful side of their children. Parents often co-lead group discussions. 6th and 7th grades are gender directed; however, the 8th grade has at times discussed co-ed selections. It is an enriching, "safe", and wonderful way to explore literature beyond the classroom and build a meaningful bridge between the home and their school. Creative Writing Club is a club for middle school students who love to write, rhyme, critique, create, doodle, draw, laugh and learn. We meet from 3-4:30 p.m. on Thursdays during the school year in the Parish Center Library. Our annual goal is to publish a new edition of “Write Outside the Box,” which is our literary magazine. Math Club is open to 7th and 8th grade students. It meets from October-March, on the first through third Mondays of the month, in Mrs. Dahm's room during lunch and recess. Students participate in group problem solving of several different types of math problems, utilizing various types of problem-solving skills. Math Club is not a remediation or tutoring time. Please do not join Math Club if you cannot commit to the full year. There will be three potential meets throughout the year, and a culminating inner-club meet at the end of March/early April. Each of the three meets take place offsite. Two are on Saturdays, and one if during the school day. These are not required and students do not have to attend if they do not want to. Forensics is offered to students in 6th, 7th & 8th grade.The purpose of middle school forensics is to build self-confidence and oral competency by developing and practicing fundamental public speaking skills. Hang Time is a series of social events for 7th and 8th grade students at Christ King School and in Christ King Parish's Religious Education Program. Events are organized and chaperoned by parents and are designed to be self-funded. Annual events include a back to school swim party in August, a fall dance held at the school with a DJ, a trip to Comedy Sportz, a bus trip to Sunburst for snow tubing, and a spring dance. New ideas for events are always welcome. Hang Time provides a chance for our kids to let loose and have some fun with their classmates. The kids very much look forward to all of the events! Discovery Project courses combine online instruction and face-to-face workshops for Archdiocesan students in grades 7 and 8 who are academically gifted. Students will be exposed to a range of challenging activities to develop critical thinking and 21st-century literacies. Courses run for nine weeks and are designed to replace or enrich one quarter of the curriculum for the student’s home school. Students who select to replace their current course will work independently in a library or resource room setting with Internet access to complete daily tasks: responding to assignments and classmates comments online, completing research, writing papers and reading. Students will also experience three half-day workshops hosted at the cooperating Archdiocesan high school. Students who select the course as an enrichment would complete online requirements in addition to their regular course load.